Where. The heck. Am I? There's a cowboy down the end of the bar doing karaoke. He's not one of those gets-dressed-up-for-tourists cowboys. He's an actual cowboy, complete with wide-brimmed hat, long overcoat and a pistol dangling from his belt. He's also, frankly, murdering a John Denver song, but who's going to heckle the guy with the six-shooter on his hip? The bartender smiles, wiping spilt beer off the wooden bar before gently ribbing one of the other cowboys, a guy with a moustache who's sitting next to me, nursing a bottle of Coors Lite. "You gonna git up next?" she asks. The guy shakes his head. "Uh uh. I don't sing and I don't dance," he says. "I drink and I smoke." I figured the cowboys would probably be hanging out in the saloons tonight. Driving into town earlier today, I'd been told to call into the Chamber of Commerce to get a few local tips. The town of Beatty, Nevada, really only has one street, so you'd think it would be easy to find, but I drove up and down a few times before realising the Chamber of Commerce is a wooden shack next to the gas station. Inside, a woman named Debbie had given me the lay of the land. "There's three choices to go to tonight," she'd said. "And they're all right here across the road. 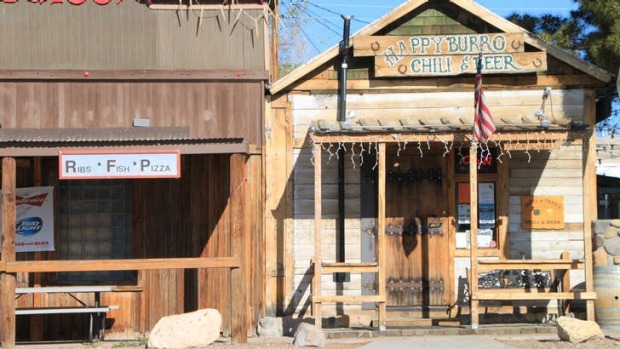 You've got KC's Outpost Saloon, the Happy Burro, and the Sourdough Saloon. "It's Friday night, so the cowboys should be in town. They'll be wearin' all their cowboy clothes, and you know why that is? 'Cos they ain't changed in a hundred years!" There was a good chance, Debbie added, that the cowboys would be carrying guns. "But they probably won't be loaded," she assured me. "Or if they are they'll be blanks." It was the first time today - but definitely not the last time - that I'd wondered: Where the heck am I? Beatty, Nevada, is in the middle of nowhere. The night before I'd been in Tonopah, an old mining town that at the time I'd thought was the middle of nowhere, but I was wrong. Tonopah was just on the outskirts of nowhere. Beatty is in the middle. It's a one-horse town that's lost its horse, a dusty, dry place in the depths of the Nevada desert, population 1100. Beatty bills itself as the "Gateway to Death Valley", given its proximity to the renowned national park, although a T-shirt in KC's Outpost Saloon explains that it's actually "Death Valley: Gateway to KC's Outpost Saloon". Rhyolite, an old mining centre that is now a ghost town, is just up the road. Beatty itself isn't a ghost town, although glance at the boarded-up shops and you might think it has a foot in the grave. But there's life here - even if it is cowboys driving pick-up trucks with bull horns on the bonnet. Where the heck am I? Beatty is all so fantastically strange. It's an old western movie come to life. These are the kinds of places that make travelling great, the towns that submerge you in a foreign world, that let you experience a totally different way of life. It's culture that's not a performance, but a way of life. As the sun sets I make my way to the Happy Burro, a wooden shack about three metres by three. Tonight those nine square metres are filled with local cowboys and their "floozies", women dressed to the nines in western get-up. Debbie from the Chamber of Commerce recommended the Happy Burro. "They might seem like regular folks in there," she said, "but most people don't realise they're prize-winning chilli cooks." I would have realised, because the bar's walls are plastered with trophies from local chilli cook-offs. I take a seat, and the bartender has guessed my order. "Beer and a bowl of chilli, hun?" Yes siree. And it's delicious, prize-winning by any standard. Once that's polished off, I feel I owe it to myself to check out karaoke night next door at KC's Outpost Saloon. It's not a fancy place, KC's, not decked out with western memorabilia or souvenirs. It looks like someone's old lounge room, with a few bottles of whiskey and some beer. The cowboys are in tonight, hats on heads, boots clopping on the floor. Once the guy in the long coat has finished butchering his John Denver song, one of the floozies takes the microphone and chooses her tune. Seems there's two types of music they like in Beatty, Nevada: country, and western. This floozie can sing. She belts out a country ballad like nobody's business, soaring to the high notes, getting the cowboys whooping and hollering. I just shake my head and laugh. Where the heck am I? The writer was a guest of the Nevada Commission on Tourism. Have you ever visited a surprising place off-the-beaten track that ended up being a travel highlight? Share your stories below.